Want to change the future? Start today! The way networks are operated today is putting companies at risk in terms of availability, time to market, security and total cost of ownership. The biggest risk is 'human dependency' as most networks are still managed manually. Statistics show that still 80% - 90% of network outages are caused by manual configuration errors. Consequently, according to Gartner, 80% of a network’s TCO is spent in post deployment. The challenge is to control all operational processes, network changes and configurations during the entire lifecycle of a network. Today, engineers and operators typically make choices based on their own interpretations while manually changing configurations, deploying services and fixing problems. This causes networks to continually spiral away from its original design rules. Consequently, too much time is spent on analyzing and fire fighting while networks become complex, inflexible, instable and costly. A new approach is needed. Design Driven Networking is about enforcing standardization, architecture & design and processes throughout all stages of a network’s life cycle, across multiple vendors and technologies with an integrated and collaborative approach to network change management. Instead of having different teams work with their own tools, processes, information and interpretations, teams work together in a uniform way, with one single view of the network, using one application to build, operate and maintain networks. Design Driven Networking puts companies back in control, with one approach to run and automate multiple networks across multiple domains. Customers and analysts referred to it as "your network in a box". One place where all networking knowledge, processes and architectures are managed to fully standardize and automate networks. For decades network vendors have taken a technology approach to solve network challenges. However, we believe this is not the best way to make networks more stable, agile and easier to automate. There will always be more and better technologies available, but it's not the vendor’s prime interest to make networks vendor independent, as this limits them in selling more of their products. As a result, vendors will always develop new ideas and new (proprietary) technologies. Companies can no longer afford to have a single vendor policy anymore nor can vendors keep up with all developments to offer one total solution. This is a catch 22 and the only way to solve this, is to take a vendor- & technology agnostic approach to run networks. This can be done managing network- and service abstractions. The only way to do this is, is by focusing on standardization, process control and by enforcing architecture & design principles for all network changes. This is what Design Driven Networking is all about. 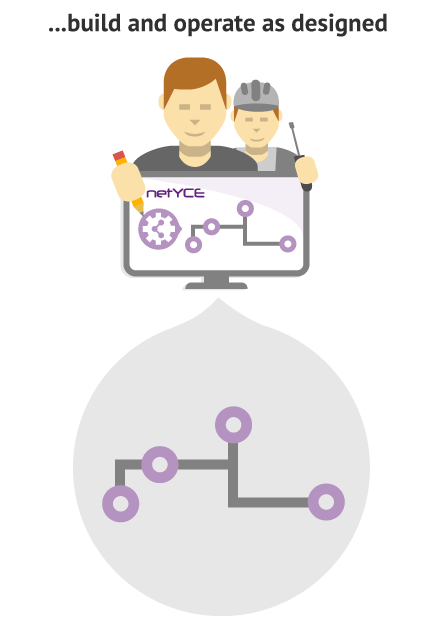 Based on the principles of Design Driven Networking, NetYCE developed its unique 'network in a box' platform that provides full control over all change management aspects throughout the entire lifecycle of a network. The business benefits are impressive; significant cost savings, stability and greatly improved time to market of new service. NetYCE has proven that Design Driven Networking can reduce overall TCO between 25% and 50% by freeing up overloaded engineering teams performing repetitive tasks at odd hours, doing more work with less expensive operations people, offering self service functionality to end customers or partners and by enabling full automation and orchestration. All with the philosophy, “Design once, Automate many”! 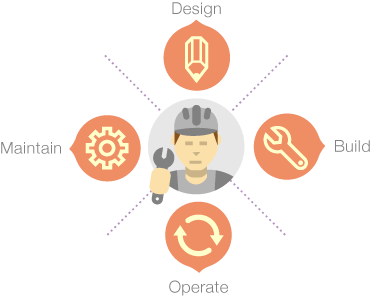 Architecture & design should be leading during the whole lifecycle of a network. This is normally not a problem during initial rollouts, however, it is essential that this is sustained for all future changes, additions and exceptions. Enforced correctly, networks become highly stable, scalable and flexible. Also more sophisticated and complex network services can be implemented without effort. The way to do this is by using modeling, templates and scenarios. 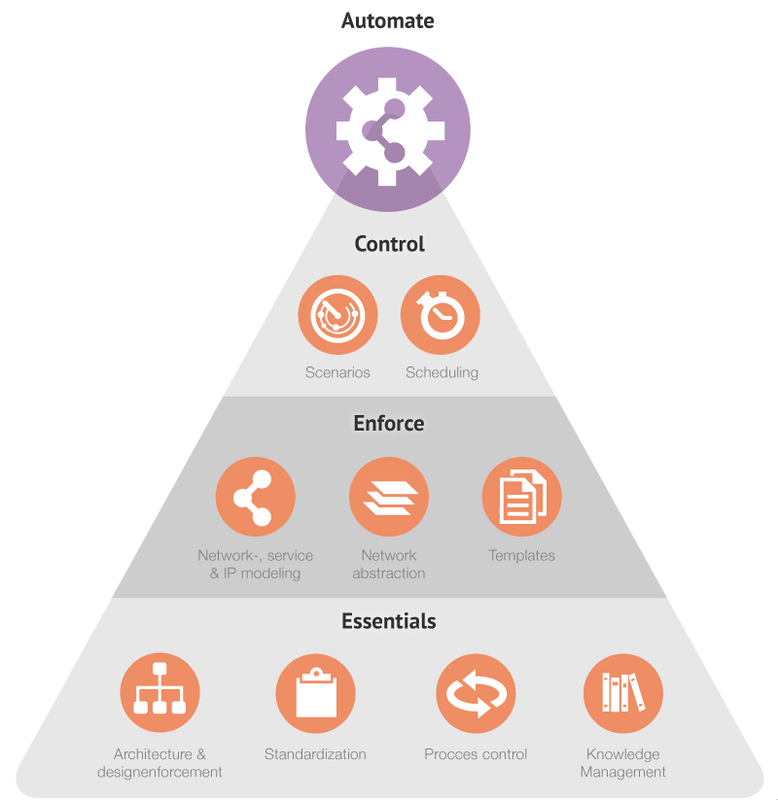 Standardization is the cornerstone for successful automation and it starts with complying to the chosen architecture, services and hardware options as defined by architects and designers. And should be extended in the way parameters are used. Standardizing on allocation of IP addresses, numbering of VLANs, definitions of service profiles, attributes and other naming conventions are essential to automate networks. Furthermore, configurations and changes should be standardized. In practice, engineers may use different commands to solve different things, such as activating services, solving issues or upgrading devices. 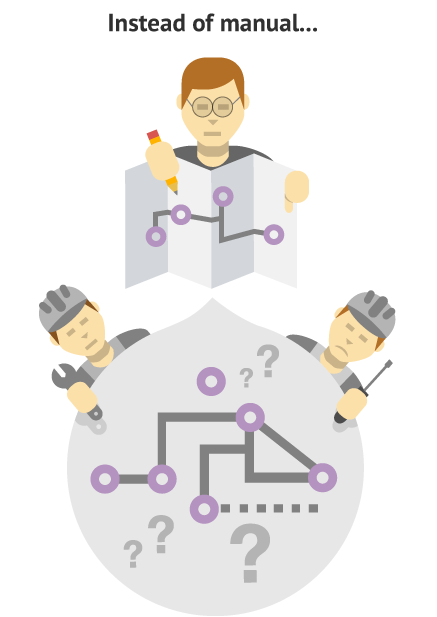 Design Driven Networking ensures that configuration changes are consistent between engineers. Traditionally, all networking knowledge and information resides on the network devices and in the heads of engineers. Design Driven Networking ensures that all knowledge is explicitly put into models, templates and scenarios so people can share best practices, reuse information and automate processes. When deploying the generated configurations, the production network is automatically updated. Furthermore, by adopting Design Driven Networking, a full inventory is created with explicit understanding of all networks and services. This is extremely useful for knowledge sharing, integration and troubleshooting. Instead of analysing in the production network, this can be done in the system first. Modeling is a key concept within Design Driven Networking. Instead of using difficult programming skills the network to activate services, modeling is used to translate network designs into executable models that can be used over and over generating different but standardized services. Upon execution of the models, an abstract view of the network is created, with clearly defined parameters and relationships. Modeling is not limited to the technical design aspect. Also processes, roles and responsibilities can be modelled to enforce a desired way of working. This may vary from giving operators the freedom to perform certain tasks to modeling an end to end automated process without manual intervention required. Abstraction enables networks to be managed, irrespective of type of vendor or technology. 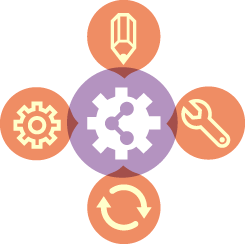 All relationships, services and parameters are build and maintained in a vendor agnostic way. This is very powerful as migrations, consolidations or replacements of different vendor's hardware can be prepared in advance in the abstract network. Templates will take care of translating the abstract network with all managed parameters into vendor specific configurations. This is done through substitution of parameters from tested, ‘golden configurations’ and by using conditionals to generate configuration commands for specific vendors or technologies. Scenario's are basically scripts that take care of how the communication in the production network should be done. Engineers can define these themselves so others will always use the same scenario for doing upgrades, migrations, roll back's etc.. Through scheduling, all jobs and changes can be planned for at the convenient time, either directly or during a given maintenance window. This can be done attended or completely unattended as 'first time right' changes are guaranteed. Massive changes are now possible. Combining changes with scenarios will take care of things like automatic rollbacks in case of failure. In the morning, the networking staff simply validate the executed changes. The result of adopting these essentials of Design Driven Networking is the ability to ‘design things once and automate many’. This is extremely powerful for doing more with less people, deploying new services more quickly, make life cycle management significantly easier, while guaranteeing compliance and reduce vendor dependence. Additionally, new business concepts can be offered to partners and end customers such as self service or (out)sourcing activities.